Top-down spaghetti Western fighting game Secret Ponchos from Developer Switchblade Monkeys is coming this Summer for PC via Steam Early Access. Up until recently it was suppose to be exclusive to the PS4, but with a tweet from Switchblade Monkeys, it would instead come to PC via Steam. Late in March, Secret Ponchos was delayed on PS4, which took it out of the question for making it for an April launch. Switchblade Monkeys wants to bring the game to beta to make sure everything is ‘rock solid’ before launch. Secret Ponchos is due to be at PAX East later this week. “We realized Early Access would be the perfect program for this; it creates an environment where we can self-fund development of the PC version to make it a reality, in addition to exposing all versions of the game to a broader round of polish and tuning that you can only get when developing with an actual beta community of players,” the president of Switchblade Monkeys Yousef Mapara said. 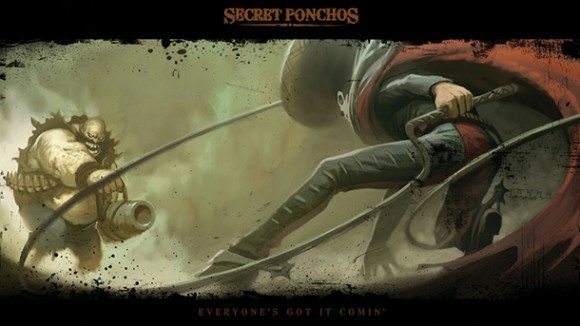 Secret Ponchos as mentioned above is Western fighting game set in the Wild West, where the attitude and feeling of the game feels like it is out of a graphic novel. You are in a town just filled with bandits, bounty hunters and murderers and you are playing as an outlaw with a bounty on your head and everyone is hunting for you. Make the legacy you want to be known for in the game, by being the best and surviving and gaining notoriety and reputation by defeating your opponents, getting achievements from those opponents and making them yours. Players can fight in one-vs-one duels, engage in gang fights, or Free-For-All mode. As you gain reputation points in the game, you will be able to upgrade both abilities and appearance for your own outlaw. The choices from the outlaws currently are The Killer, Gordo, Kid Red, The Deserter, and Phantom Poncho, each with different stats and weapons both primary and secondary. UI designer Caley Smyth told Polygon that the game does look like a multiplayer online battle arena (MOBA) because of the way the map is laid out, but the actions that a player performs would be more similar to fighting game moves because it’s based on reaction. Doing the same attacks will only get you to certain extent of fighting, so it is better to use strategy and reflexes to use combinations of close and long-range attacks to dodge and defeat your enemy in any way possible.